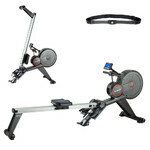 Professional rowing machine with magnetic resistance, can be synced with app, long rail, HRC function, high weight limit. Single-handed plastic 3 kg dumbbell, bell-shaped, cement filling. 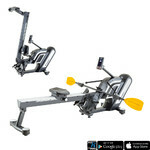 The Rowing Machine inSPORTline inCondi RW600 is a professional rowing machine which allows the user to enhance their workout through a mobile app. It features a magnetic braking system which offers as many as 16 resistance modes (which you can switch between on a backlit LCD display). 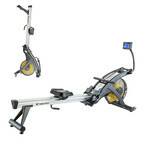 This rowing machine provides a versatile workout as it offers 12 preset profile programs, a virtual race against the computer and an HRC program, which (when used with a chest strap) adjusts the resistance to keep the user in the preset heart rate zone, thus allowing for a more effective workout and fat burning. Also related to your heart rate is the Recovery program which tracks your fitness based on how quickly your heart rate returns to normal after the workout. 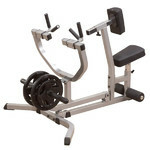 You may also appreciate the user program which you can fully adjust to fit your needs (including resistance). During the workout, you can follow all the important information on the display: time, distance, strokes per minute, calories burned, average time (for a 500m race). On the display you can also see the graphic profile of your workout. The inCondi technology allows you to sync this rowing machine with your smartphone or tablet via Bluetooth and a mobile app. In the app you can control the machine from your mobile device. The main feature of the app is that it enables you to record your workout data and evaluate them. Moreover, based on your previous results, you can also plan your future workouts. Do not hesitate to share your successes with your friends on social media. And if you are looking for distractions during your workout, just go to the videos page or start browsing the Internet! 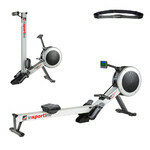 The Rowing Machine inSPORTline inCondi RW600 also features a folding frame and transportation wheels, which allow you to move the machine to a less populated area after your workout. The rail is 98.5cm long, making it suitable for users up to 2 meters tall (i.e. virtually everyone). The wide ergonomic seat of high-quality PU plastic and adjustable footrests with tightening straps allow for a comfortable workout. Built into the rail, the ball bearings ensure smooth seat movement. When the floor is uneven, you can adjust the height of the frame using the adjustable pads. Its sturdy structure allows for a 150kg weight limit, making the Rowing Machine inSPORTline inCondi RW600 perfect for commercial use. Strengthening your stabilization muscles will help you reduce longterm back pain.